I had to wait 15 years into my marriage and at the age of 40 for God to bless me with my one and only time-sucking monster. She is now 10. She is high functioning autistic. I wouldn't trade having been blessed with her for anything in this world. such adorable babies! a lovely picture. i am the mother of an adopted son now age 36 and the guardian of a sixteen year old girl with lots of troubles...and i know what true blessing is. i also hope this journalist gets herself sterilized so that she is not tempted to committ murder. The sad part is that although the Pro-Life poster was correct these Feminist shills keep recruiting the daughters of Pro-Lifers, Christians and Conservatives to keep their legacy alive. I wish all parents with daughters were like you Patrice and raised their girls to resist such diatribe. 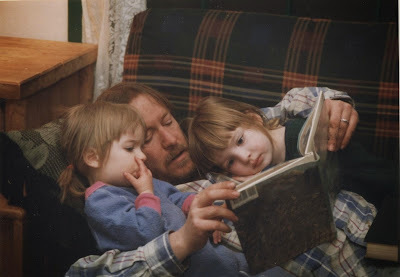 What a precious pic of Don and the girls! well...I'll give her credit. She's at least willing to admit that she isn't cut out to be a parent. So many figure that out after the kid shows up. But if she feels that strongly against parenting -- and that's okay -- she should take more permanent steps to control that situation. my time sucking monsters are now 27, nearly 25, 23 and 22. And we adopted a 7 year old little girl 9 months ago. I hope we can adopt again in the next year or so. I agree that if Ms Marcotte feels so strongly about not having children she should defintely find a more permanant solution for birth control. And this is what our "free" public education and media/entertainment industries have created. You are right... it would be better if this mentality would never procreate. Sad that she was molded into this particular mind set. Lots of others just like her out there where their only thought is "what's in it for me". When my wife and I got married we thought (because of what her doctor told her) that we would not be able to have children. 13 months after our weding, we proved him wrong, and went on to do so again three more times. When my wife was pregnant with our first child, I worried about how I would react. Objectively, I kne I had a selfish streak in me, and later I've found out I have Asperger's Syndrom, which serves to augment that problem. BUT I happily discovered that our baby was a joy to have around, in spite of the late nights, colic, and the need to pack all the baby stuff for even small trips. The only really "bad" times were our two oldest boys' stormy teen years, but we got through. Our youngest developed autism (He got the gene from me.) but even the additional hassles associated with a special-needs child are offset by the joys associated with each little victory. This woman must have a miserable existence - NOT because she has no children, but because of her attitude that her reasons reveal. For those with the blessed disposition , and the good fortune to have a child in a happy stable home , I believe higher or more fulfilling existence as a human being . But, I concede that not every person should be a parent . And I can think of few worse fates than that of a child born to a parent that did not want them . As it is said do not cast pearls before swine, the person referred is very swine like , and is not cognizant that children are a gift and worth more than rubies and gold. I say go ahead on , she can be bitter and all alone in her older years. "I choose me." God help that woman. That mindset is behind every evil in the world, directly or indirectly. Good thing that for believers, Christ did not say, "I choose Me." I am happy if she has the clarify of mind to understand this. I just wish her decision would also extend to understanding if you do not have children, you do not get the right tell others how they should raise their children. Amanda is another narcissist. The larger issue is her and America’s naïve acceptance of abortion. The majority of the 55 million American babies murdered, were done so by mothers who call themselves Christians. This never occurred in Early America. Why now? When was the last time your Pastor took a PUBLIC stand against abortion? America's pulpits should be ON FIRE every Sunday preaching against America's Holocaust! If your Pastor is failing to take a public stand, why are you supporting him? I’ve heard the naysayers’ convenient and erroneous interpretation of Romans 13. Sorry but did Christ bow to government? Did He instruct us to submit to evil (though legal) laws laws like Roe VS Wade? Neutrality is not an option for Christians. Pastor Dietrich Bonhoeffer's message to Christians and Pastors in Nazi Germany is strikingly relevant today. He said, "Silence in the face of evil is itself evil. God will not hold us guiltless. Not to speak is to speak. Not to act is to act." The majority of Americans (73%) identify themselves as Christians according to the Pew Forum (2010). This is substantiated by the American Religious Identification Survey (2008) which showed that 76% of the American adult population identified themselves as Christians. I think women like that should get their tubes tied so they can't reproduce if they feel so strongly about it. Having recently had a 3rd trimester stillbirth earlier this year and now being 6 weeks pregnant again I do occasionally read the babycenter birth club posts for my upcoming birth month and it really sickens me seeing so many women join that group and vent about pregnancy and talk about how they plan to get an abortion, when there are so many women on the group and in the world in general who have had miscarriages and stillbirths and would do anything to have a live baby to take home. Really if you don't want kids just get yourself sterlized, better for the world that way. Liberal people like that writer tell us that no one should be allowed to tell another person what to do with their own body. Blah, blah, blah. But when we choose to put some sugar into our own bodies in the form of a cookie they go ballistic and can't preach loud enough. When conception happens, it's no longer just your body. That cold woman scares the creepy-crawlin' bejeebers outta me. Amanda Marcotte probably has an undue fear of birth control failure; I doubt there men lined up to attempt to breed with her (although there are some desperately pent-up males out there). Every time I start to rethink my pro-life stance, someone like Ms. Marcotte opens her mouth and causes me to remember why I changed sides in the first place. If she doesn't want kids-- great, don't have 'em. That's fine. Whatever works. God knows I'd hate to see what kind of mother she'd be (and I probably wouldn't want her for a neighbor, either). I don't know where she got her vision of motherhood-- I think it must be another feminist, progressive delusion that's been foisted upon us. I've got four kids and few complaints about not getting to do what I want, within reason when I want. There's that self-sacrificing martyr-mother illusion again-- can't say I'm particularly eager to meet the kids that one turns out, either. Amanda Marcotte can have her opinion. That's fine; I don't mind. I DO mind the fact that her views and values are shoved down everyone else's throat as "the only reasonable, realistic, responsible, forward-thinking way to feel." I'm sure glad my family didn't feel that way-- they would have put me out with the trash. If this is where our culture is going, truly it is becoming a culture of death. Welcome to Huxley's Brave New World. A childhood friend had an abortion. Shockingly, her mother drove her to the hospital. My friend was adopted! Over the years she would ask me about one of my children. He was born around the time she made "that decision." I do not think she ever "got over" her decision. Very sad. Post abortion trauma is real. As an aside, the feminist movement has its roots in Communism//Frankfurt School. I feel very sorry for the women who have been duped by this lie. Instead of being free thinkers they are really being manipulated, with the end result of a sad, unhappy life. Even Beatrix Potter, who married very late in life, and I suspect having been influence in the emerging feminist movement, said her marriage was her Crowning Glory. I have seen several public statements like this recently, and it makes me so sad. I realized, how you think of babies is ultimately how you think of your own existence. After all, if you believe you ruined your mother's life by being born - you are going to be afraid of that happening to you. So very very sad for someone to go through life loathing themselves that much. If people want to be taken seriously, they should clean up their language. I have no respect for anyone who can't control their tongue... or written language as the case may be.